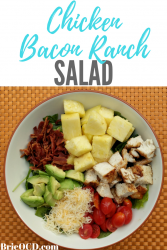 This Chicken Bacon Ranch Salad is a twist on your traditional Chicken Bacon Ranch Sandwich. I figured why not make a healthier version that is also jam packed with goodness?! 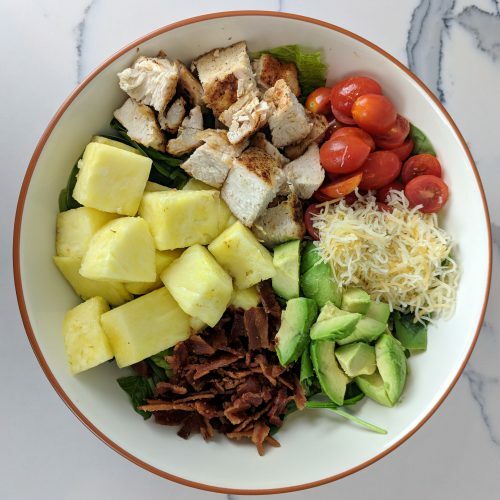 This salad has 419 calories, 22 carbs, 15g fat and 46g of protein without dressing. If you use the bbq ranch dressing I made up for this salad the stats are 497 calories, 20g fat, 30g carbs and 48g protein. If you want to lower the fat content there are multiple ways to do so! You could use fat free dressing instead, use less bacon or use less avocado (however avocado is full of healthy fats!). 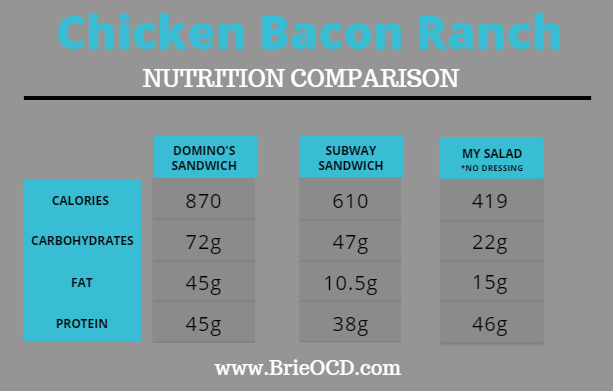 I compared my salad recipe with Domino’s and Subway’s Chicken Bacon Ranch sandwiches and as usual the stats are shocking. Now I know, I am comparing a salad to sandwiches BUT that is the point here. To make healthier versions of our favorites in our journey to becoming healthier and happier! 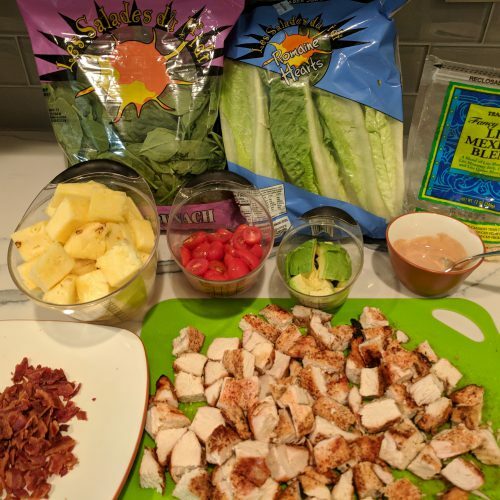 I make 24oz of chicken in advance and cut everything up so that all I have to do when it comes to making the salad is throw everything together. (Click here for how to cut and core a pineapple!) If you do that it will take you less than 5 minutes to get your salad ready for the day. Initially it took me 25 minutes to get everything prepped. This salad is gluten-free! I used Sweet Baby Ray’s bbq sauce and Hidden Valley Ranch Greek Yogurt Ranch for the dressing. Just beware that some bbq companies manufacture other gluten items in the same plant so just be careful and read your labels! It is in the 80’s here in San Diego so I definitely did not want to turn on the oven to cook the bacon. I also didn’t feel like cleaning the griddle so I cooked the bacon in the microwave. I like my bacon well done so I usually do a minute per slice. 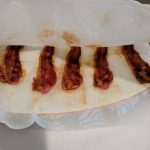 Easiest way to cook in the microwave is to sandwich the bacon in between two paper towels (on a plate) like my photo to the right! I buy my bacon at Trader Joe’s. Its my favorite, low calorie and crisps up nice! Hope you enjoy this hearty and healthy salad! 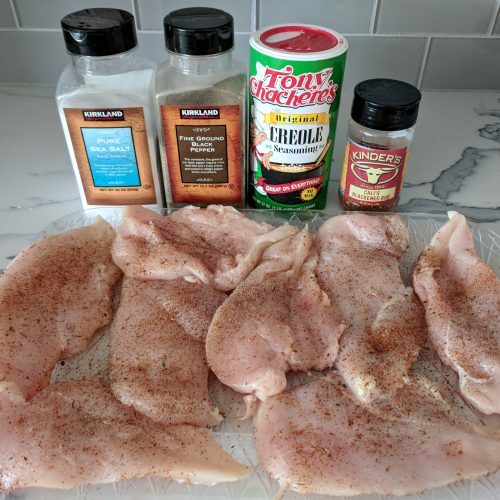 cut chicken breasts in half lengthwise and lightly season both sides with salt, pepper, creole and blackening seasoning. 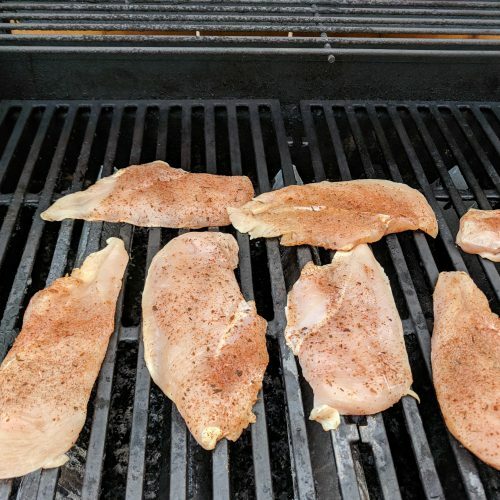 grill chicken for approximately 10 minutes or until internal temperature reaches 165 degrees. flip halfway through. Let cool and cube. 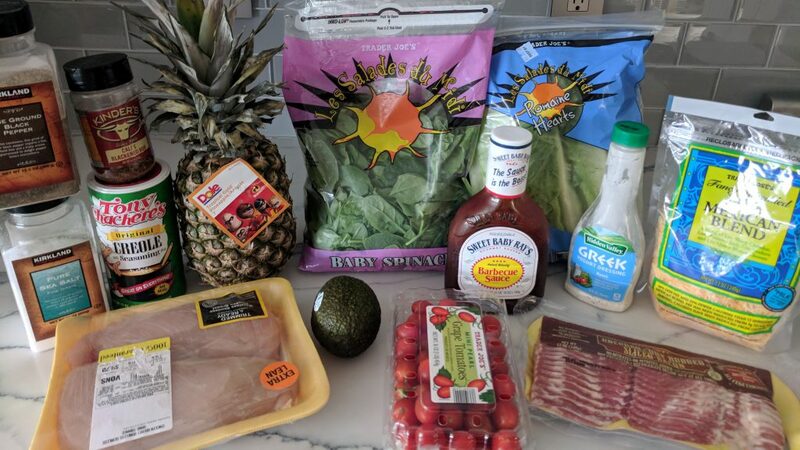 cook bacon, cut tomatoes, cube avocado, core and cube pineapple (click here for how to cut and core pineapple). line up all components for later. 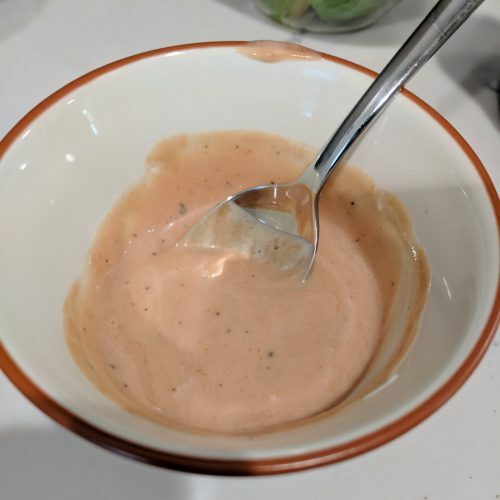 make dressing by mixing bbq sauce with ranch dressing. 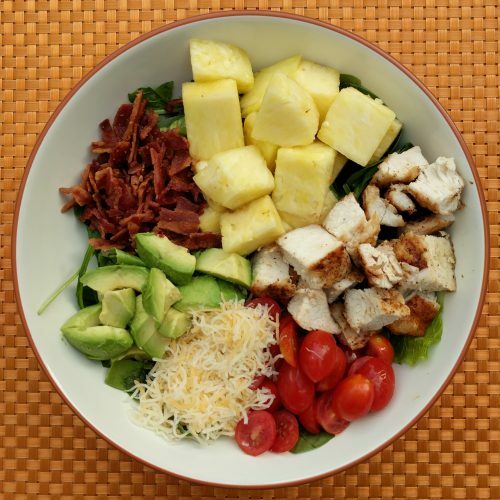 start creating your salad by layering lettuce, tomatoes, avocado, pineapple, cheese, bacon and chicken! Top with dressing and Enjoy!